2004 Wheels American Thunder Thunder Road #10 Tony Stewart race used tire material in mint condition. 2004 Press Pass Eclipse Skidmarks #5 Mark Martin in mint condition. This card states that it has been 'Enhanced with race used tire technology'. 2004 Press Pass Eclipse Skidmarks Holofoil #10 Dale Jarrett (#88/500) in mint condition. This card states that it has been 'Enhanced with race used tire technology'. 2007 Press Pass Eclipse Skidmarks #5 Denny Hamlin in mint condition. This card states that it has been 'Enhanced with race used tire technology'. 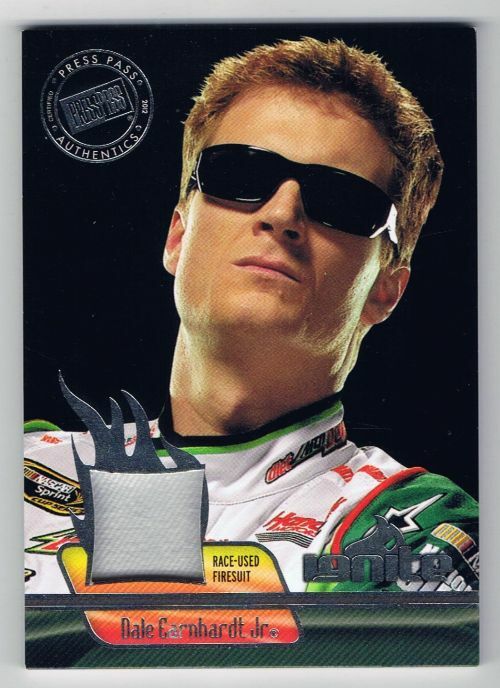 2012 Press Pass Ignite Materials Silver #IM-DEJ2 Dale Earnhardt Jr. Race Used Firesuit in mint condition. 2012 Press Pass Legends Pieces Of History Memorabilia Silver #POH-EI Ernie Irvan Race Used Firesuit (#98/199) in mint condition. 2006 Press Pass Eclipse Skidmarks #1 Kyle Busch in mint condition. This card states that it has been 'Enhanced with race used tire technology'.